Marine Le Pen, the daughter of the founder French National Front Jean-Marie Le Pen is doing well in the polls. November last year she even scored higher than the sitting president Nicolas Sarkozy. Moreover, the National Front is doing very well among young voters and the workers. She is gaining momentum and she wants to change the edgy image of the National Front to appeal to a greater public by renouncing anti-Semitism and reaching out at Israel. In November 2011 she was in New York to visit the United Nations, where she had a meeting with the Israeli ambassador Ron Prosor, which later said it was based on a ‘misunderstanding’. What has happened? Has Marine Le Pen been spotted with streetfighters in army boots?? On 27th January Marine Le Pen attended the yearly debutante ball in the famous Hofburg in Vienna, which is organized by the ring of student corporations, which can trace their roots back to the 19th century. It was the 59th time the ball had been held, but in recent years radical-left organizations have been protesting against the ball being held in the Hofburg, and got their way: this year was the last time the ball will be held in the Hofburg. Marine Le Pen attended the ball at the invitation of Heinz-Christian Strache of the Freedom Party of Austria (FPO). However, this year the radical-left was supported by multi-millionaire and real estate mogul Ariel Muzicant, the president of the Jewish community in Vienna, because the ball was held on “Holocaust Memorial Day” which happened to coincide with the traditional time for the ball, the last Friday in January. 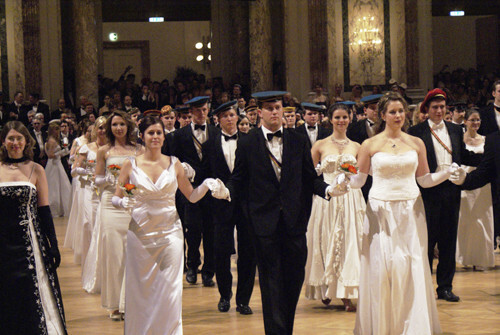 Supporting a ball of debutantes in the presence of tradition-minded young people and other European nationalist leaders is considered to be in the presence of “neo-Nazis”. The violent leftist howling crowds outside the Hofburg are supposed to be the “normal people,” because of their reverence for Holocaust Memorial Day. This is yet another proof that Jews always side up with the left against the bearers of European tradition.